Erin serves as an Associate Lecturer, specialising in Applied & Educational Theatre. She is a Co-Director of Doorstep Arts in Torbay: a grassroots organisation providing sustainable long-term participatory arts enrichment for children and young people in an area of statistically low socio-economic status. Doorstep Arts works in collaboration with Battersea Arts Centre as part of the Collaborative Touring Network (2013-2018) and builds connections between outstanding touring performance and ongoing participatory work at various doorstep sites across Torbay. She also serves as the drama advisor for the MA in Creative Arts in Education, within the Graduate School of Education on the St Lukes campus. Her PhD, titled Vital Spaces/Vital Signs: Young People, Performance, Identity and Dialogue, examined the ways in which devised theatre practice with young people aged 13-19 creates pedagogically rich space for dialogue about identity and social change. From 2013-2015, Erin worked on the AHRC-funded Amatueur Dramatics: Crafting Communities in TIme and Space as a postdoctoral research fellow. This research was led by Jane Milling (Exeter), Helen Nicholson (Royal Holloway) and Nadine Holdsworth (Warwick) and was the first major study to seriously consider the social and cultural dimensions of amateur dramatics. Erin's research interests include: participatory arts, social justice, community engagement, pedagogy, and theatre in education. Her own interest in the ethical concerns regarding digital mediums and participant voices are explored in a case study authored here: Capturing the Ephemeral, a case study. 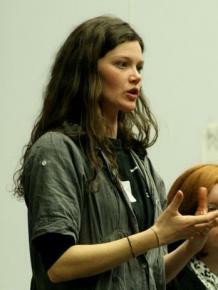 As a practitioner, Erin facilitates and directs devised theatre, using creative writing, physical techniques, dance and original music to create new works with young people. Erin's research is conducted through practice. Much of this work is led by Doorstep Arts in Torbay. This grassroots and community-based action research enriches the Applied Theatre courses by creating practical placements for university students. It is funded through Arts Council England, Esmee Fairbairn, the Jerwood Trust, National Lottery, Children in Need and the People's Health Trust. Erin's work is practice-based, and depends upon strong partnerships with the local community. As former Artistic Director of Devon Youth Theatre, Erin developed a long-term partnership with DAISI (Devon Arts in Schools Initiative) to provide a free schools theatre outreach programme every January/February. This outreach programme culminates with a showcase at the Exeter Northcott Theatre. This outreach programme is continuing, now funded by the Widening Participation office & by Doorstep Arts' Open Doors Outreach programme. As one of the members of staff working with the Applied Theatre pathway, she supports university students working out in the field with various school, health and community groups. Current project placements include RD&E Hospital Children's Ward, Age UK, Magic Carpet, St James College, Cranbrook School, and the Pupil Referral Unit at the Stansfield Centre in Exeter. Through Doorstep Arts, Erin administers and produces 12 ongoing weekly groups for children and young people aged 4-25 across Torbay. These groups devise and create their own theatre, dance and music with support from professional artists. Erin is also a regional producer for Battersea Arts Centre's Collaborative Touring Network, a programme which is funded by Arts Council England, Esmee Fairbairn and the Jerwood Trust. The CTN is aiming to reinvent touring theatre through work in nine areas of traditionally low arts-engagement across the UK. Erin regularly teaches on a variety of practice-based modules in the Drama Department, but her specialism is Applied and Educational Theatre. She convenes the two elective modules which focus on community-based socially engaged theatre practce: DRA2026 and DRA3012. She also serves as the drama advisor for the MA in Creative Arts in Education on the St Lukes campus in the Graduate School of Education. Here, she teaches on MA courses EFPM224, EFPM228, and EFPM308. A former secondary teacher in the USA, Erin's own MA in Teaching enriches her pedagogical approach, and she uses a student-centred and experiential model of teaching.